A few more species and new species from this area will be added to our work later (2014), after the publication of Dominique Lamy' Book. We consider it as a valid species. So much differences between both C. boui and C. daucus : Shell pattern, animal color, average size, deph, habitat are completely different between these species.We have collected both species live and assume totally our choice of level specie according to da Motta. It can be found during the daytime at deph from 10 to 40 meters hidding in grass and sand, often not burried, just laying. It seems more common in 25-35m. In Martinique, it have been found in the south caribbean coast only. Several populations occured in Guadeloupe by the past. Some have declined after Marilyn hurricane. It could be found between 8 and 15 meters. These small shells have been a real nightmare for collectors and malacologists. 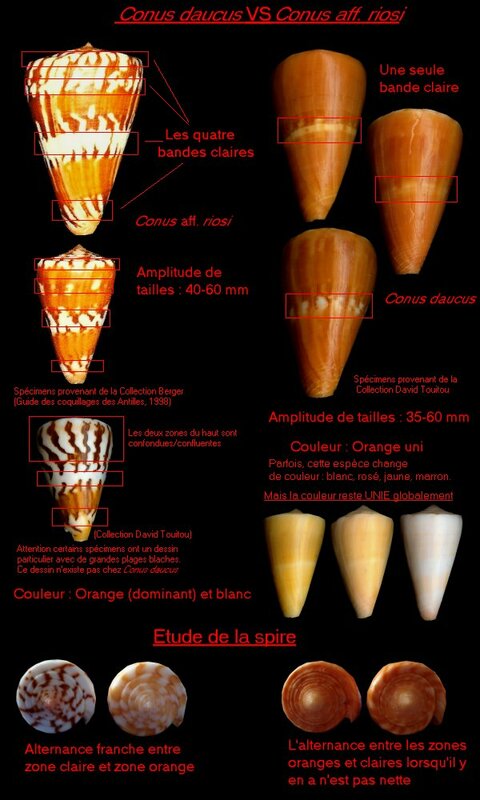 Before it was described (2012), this very local specie from Le Vauclin (Martinique) was sometime named as Conus burraye which is found in Florida, effectively it is close to this specie but it can be easily separated when you look carefully to the shells though (spire). Very recently it have been finally described as Conus colombi. 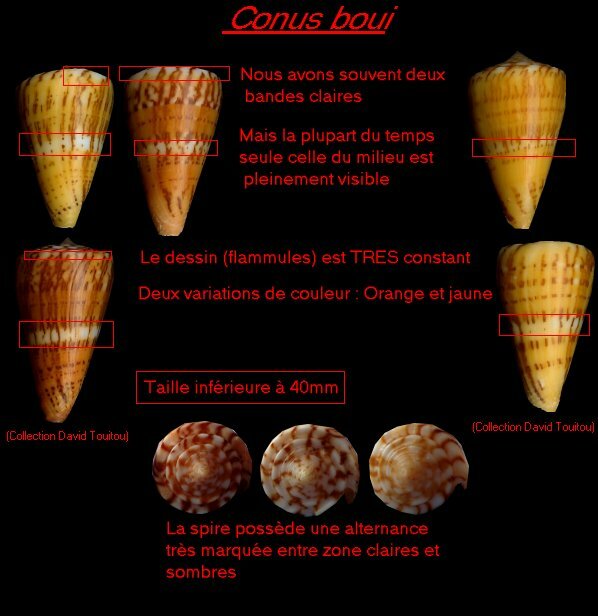 Some collectors related these shells to Conus hennequini but they are clearly very different. I have found hundreds of empty shells in Le vauclin in sand patches between grass fields in 2-4 meters of water. Shells must live in this habitat and may be found during the night. This specie is very variable in color. Animal color may also vary. The most common color is the nice orange that gave its name as the "carrot's cone". Though, yellow, brown and white shells may be found too. The white ones may have also nice pink spots and sometime a pinkish overall color too. This shell may be found since the first meters hidden in rocky fissures often camouflated with it's "algae periostracum"; big gem specimens are difficult to find now. While I was living in Martinique (2000-2002), it was really hard to find just like C. spurius. I only found fresh dead specimens in 10-20m. Among actually known species, probably the only piscivorous specie of the West Atlantic area. This specie used to be common in the past but for an unkkown (epidemic?) reason populations have declined in Martinique and Guadeloupe fastly years ago such as Conus spurius. Actually (2013) live shells have still not been collected anymore. In Martinique, divers have seen (before year 2000) hundreds of empty fresh dead shells (south Martinique) in their diving spots, this tend to show that this specie have been decimated by some pollution, virus, bacteria, parasite ? Divers (july 2014) have seen specimens of this specie in -40m in Guadeloupe. This very nice and rare shell my be found deeply hidden in rocky crevices. I only found one empty shells in 5m of water in north Martinique (Carribean sea). Divers have found also some fresh dead specimens in 5-10m in south of Martinique (Caribbean sea). Specimens have been also found on the Atlantic side like the fift specimen shown (Guadeloupe). This shell is collected in a very rectricted area. This tiny specie may only be found in a restricted area and from 6 to 18 meters. It was found in less than 6 meters by the past but it have been overcollected by some at this depth. This deep water specie may be found from 90-100m of water. I found this species in 15m of water. It used to be easy to find by the past. This species may be found crawling on the sandy areas of the rocky shorelines at night. During the daytime it is buried in the sand patches. This is not a rare shell but is is hard to spot sometimes due to it's color. It lives usually in 1-10 meters of water along rocky shorelines in small crevices or under rocks. This shell is rarer than in the past. It seems to occur deeper that Conus daucus. Live shells usually come from 20-45 meters of water. Recent finds in Guadeloupe could extend the actual range of this supposed endemic specie. This shell in commonly found on the Atlantic side, in 1m of water. 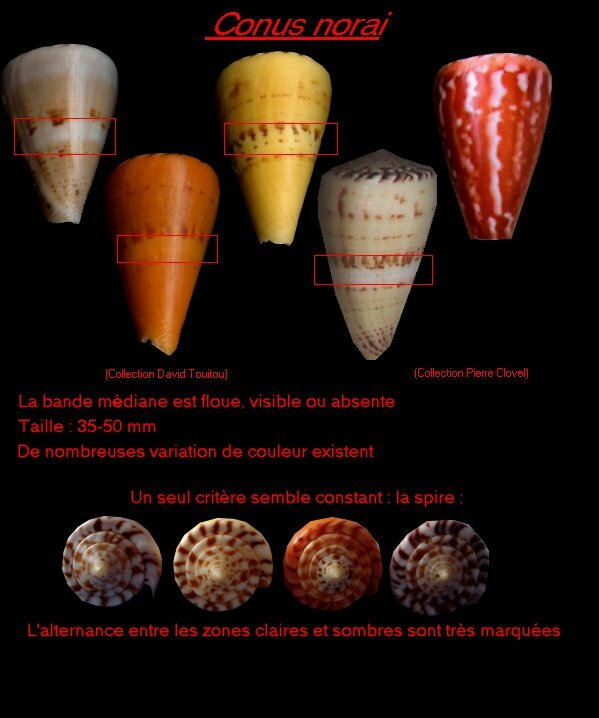 If you swin in many beaches in Martinique, you may find hundreds of empty shells of C. puncticulatus and C. puncticulatus f. columba. They live in grass fields and sand patches. They bury in the sand during the daytime. Sometime (breeding season ?) they can be found grouped even during the daytime. This specie is commonly found from shallow water to 20-30 meters deep. It's feeding on the well known "fire-worm". This specie is very variable. We could say that every specimen is unique. In my opinion the best way to separate them is to arrange specimens in several color variations : the dark ones (overall dark brown pattren), the clear ones (overall clear pattern), the yellow and orange ones that I call "citrinus variation" and of course all the orthers that are intergrades between these three main pattern color variations. In 2000-2002 I sent a lot of samples for molecular research on this species and results have shown that there was only one specie. So for that reason the citrinus name must be used as a variation name only. The animal is clearly the same in all kind of variations. Conus regius can be found during daytime resting sided to huge rocks, in sandy crevices along the rocky shoreline. It may also burry like most cones. It can be foudn also crwling during the day time, usually around 16h00, before the end of the day. This shell is very rare. I only found one empty shell in 40m of water. Though vey nice specimens have been found fresh dead by the past in Fort-de-France bay in moderately deep water (40-60m). It's a very nice shell and It may reach big sizes. Actually Conus riosi apply to Martinique populations bu also to other localities populations like the Brasil one. Some authors are actually describing this shell in order to be a new specie. While I was living in Martinique (2000-2002), it was really hard to find. I have nerver found a live specimen, only very old broken parts of shells. In Guadeloupe, live specimens may be hardly found from 5 to 10 meters in various habitats such as rubble and grass or near mangroves areas. This specie used to be common in the past but for an unkkown reason (epidemic?) populations have declined in Martinique and Guadeloupe fastly years ago such as Conus ermineus. Could be a subspecie of Conus jaspideus. Actually named as a form of Conus jaspideus by most authors.